Most popular sized balloon for dealer success!! 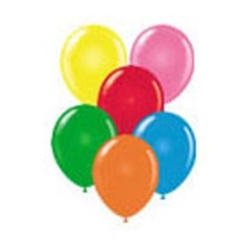 These premium latex balloons have thick walls for longer flying times, long necks for easy tying, and are the fullest, roundest shapes and sizes available. They are bio-degradable making them great for indoor and outdoor use. GREAT ATTENTION GRABBERS!! **Mix and match colors to create interest or show spirit for your local teams and organizations!